Location: Town of Gardiner, Town and Village of New Paltz, Town of Rosendale, and Town of Ulster. Located 90 miles north of New York City between the New York State Thruway (I-87) and the Shawangunk Mountains, the Wallkill Valley Rail Trail offers 22+ miles of year-round non-motorized recreation passing through active farms and orchards, three picturesque community centers, woodlands and wetlands, and the Huguenot Street National Historic Landmark District. As of 2013, the trail has been extended to the north through the towns of Rosendale and Ulster, NY. The trail passes over a historic, newly renovated steel railroad trestle in Rosendale, 150 feet high above the Rondout creek and 940 feet long. There are stunning views overlooking the Rondout Creek and Joppenbergh Mountain. Seasonal activities include hiking, jogging, running, bicycling, horseback riding, and cross-country skiing. The trail is managed, maintained, and promoted by an all volunteer not-for-profit corporation with more than 400 supporting members. 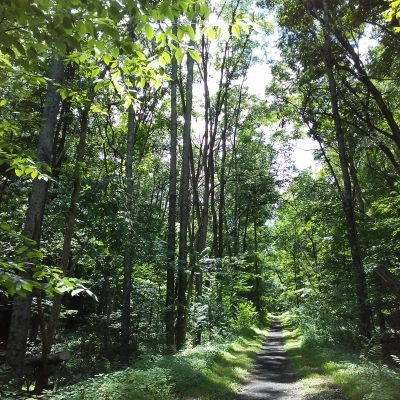 For further information including printable trail maps, answers to frequently asked questions, and a calendar of events, visit the Wallkill Valley Rail Trail website at www.gorailtrail.org. Wallkill Valley Rail Trail Association, Inc.